Some of the farmland in California's San Joaquin Valley gets only about 5 inches of rain a year. 2. California is sinking at a record pace – one farmer in the Central Valley reported his land sank more than 18 inches last year. 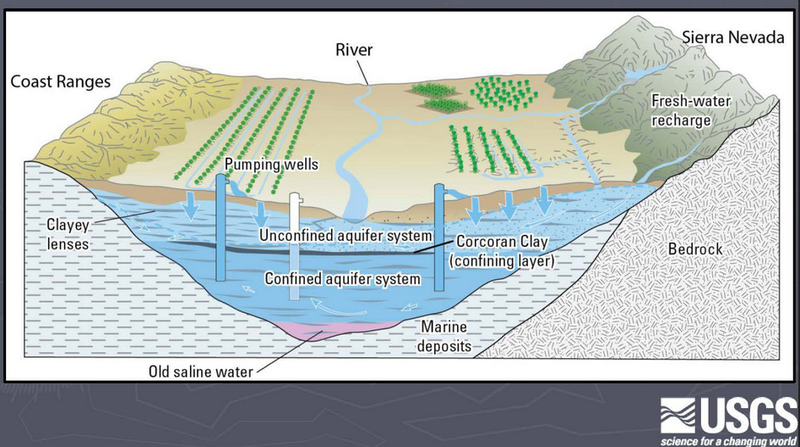 As the below-ground aquifers are drained, the land sinks to partially fill the space left by the removed water. Scientists call this subsidence. Most people call it scary. It first was documented in California in the 1930s. 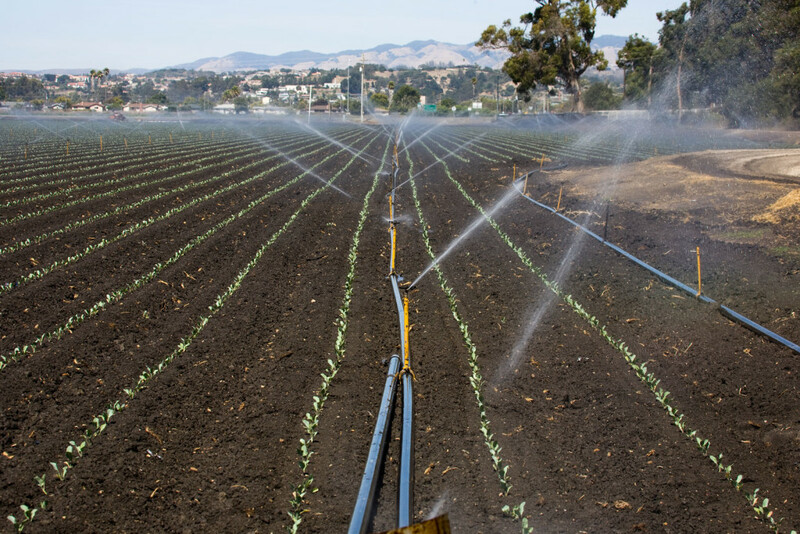 It primarily affects farmland since farmers use about 80 percent of the state’s water although, historically, cities such as San Jose and San Luis Obispo have experienced costly subsidence, too. Back in the 1960s, California farmland in the Central Valley was sinking at a record pace. By the late 1970s, some areas had sunk about 30 feet. It cost the state more than $1 billion to fix just some of the damage, which included sinking bridges, cracking canals and buckling highways, according to one estimate. The sinking took off again in 2008, and farmland now is dropping at a record pace. At least one agricultural area in the Central Valley is on pace to sink 30 feet – the equivalent of a three-story building – by 2030. 3. It will take at least 50 years for the Central Valley’s aquifers to naturally refill, according to the U.S. Geological Survey. But that’s only if everyone stopped pumping groundwater immediately. That’s because the aquifers naturally refill at a rate of about 2 million acre-feet a year (650 billion gallons) as rain and snowmelt from the mountains seep underground, according to Claudia Faunt, a government hydrologist. But she stressed that this was only an estimate. Since California doesn’t consider groundwater a public good, no government agency is closely monitoring it, including exactly how many years it will take to replace all that drained water, she said. Even so, no one believes it’s economically prudent or humanely advisable to immediately stop pumping groundwater so the aquifers can refill. That’s because researchers studying the drought at the University of California, Davis determined this year’s water shortage, which equates to a 2.5 million acre-feet shortfall, will cost the state $2.7 billion. If California farmers, who produce almost half of all the fruits, nuts and vegetables grown in the United States, stopped pumping groundwater, it almost certainly would send food prices soaring. And what happens when food prices go up? People around the world starve. 4. California has permanently lost about 18 million acre-feet (6 trillion gallons) of water during the past century, according to the U.S. Geological Survey. Aquifers partially collapsed as they were drained and forever reduced the state’s capacity to store water underground. So even if the state’s aquifers are miraculously refilled, it will be with 6 trillion gallons less, which is enough water to give every human who has ever lived since the beginning of time a 55-gallon oil drum full of water. 5. California now is pumping water that is 20,000 years old. 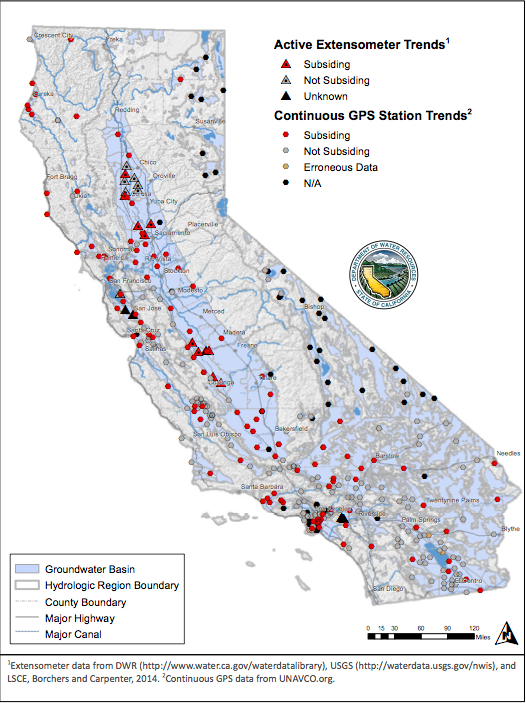 Groundwater levels have been at historic lows in most of the state since 2008, according to the California Department of Water Resources. People are drilling so deep to find water – sometimes thousands of feet – that the water being pumped to the surface seeped underground when California still was home to mastodons, an ancient creature that resembles modern elephants. 6. A great swath of the Central Valley is desert. Some of the bright-green farmland in the San Joaquin Valley gets only about 5 inches of rain a year – that’s just an inch more than Riyadh, the capital of Saudi Arabia. Before irrigation, much of the Central Valley was parched ground, cactuses and slow-growing shrubs. Now it’s increasingly covered in nut trees like pistachios and almonds, or thirsty grapevines, which are water-intensive crops and incapable of being fallowed during drought years. Overall, the Central Valley doesn’t get much rain. So as these water-intensive crops have been planted during the past decade, demands on water have surpassed the capacity of the massive irrigation canals built more than 50 years ago. The result? See No. 1 and No. 2 above. 7. No one knows how much groundwater California has left. No one even knows how much the state currently is pumping from the ground. Researchers at UC Davis estimate that close to 60 percent of the state’s water supply comes from groundwater, while hydrologists at the U.S. Geological Survey say 65 percent, and a NASA researcher told The New York Times that it is 75 percent. How is it possible that no one knows? California doesn’t require farmers to report how much groundwater they pump. Many other states do. 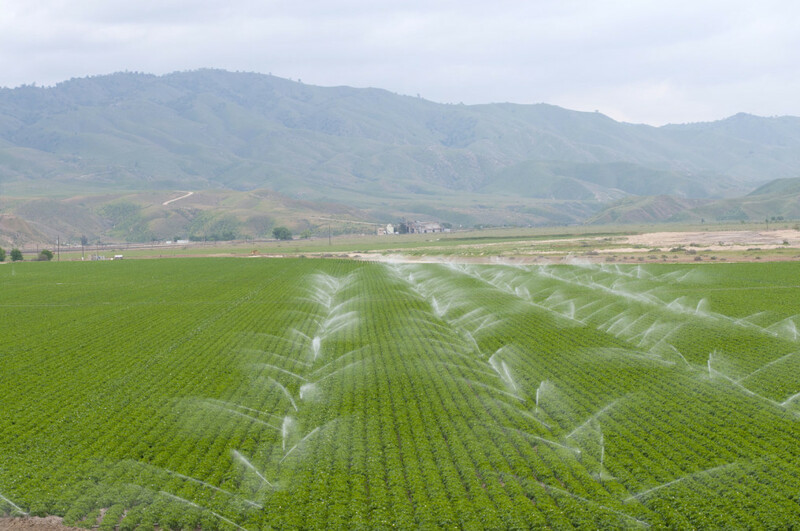 California’s new Sustainable Groundwater Management Act, which went into effect last year, eventually will require farmers to report their groundwater use, but not until around the year 2022 or later. And even then, the new law requires water officials to keep farmers’ groundwater use secret, shielding gluttonous users from public scrutiny. 8. Every time California drains its aquifers during a drought, it makes the next drought even worse. The late Joseph Poland, a legendary hydrologist with the U.S. Geological Survey who helped develop many of today’s scientific theories of groundwater and subsidence, discovered that during the California drought of 1976-77, groundwater levels dropped 10 to 20 times faster than during a previous drought a decade earlier. It wasn’t because farmers were pumping more water. It was because there was less water underground. The aquifers were smaller. They had partially collapsed during that previous drought. See No. 4 above. With less water underground, the same amount of pumping resulted in the water tables falling much, much faster. This happened again during the 1987-92 drought and is happening again during this drought. See No. 5 above. 9. The electricity needed to pump groundwater now is about 5 percent of the state’s total energy use. That’s an increase of 40 percent over normal years – or enough electricity to power every home in San Francisco for three years, according to a Reveal analysis. In Saudi Arabia, an economist calculated that the country used about 10 percent of its electricity to pump groundwater. Now Saudi Arabia is nearly out of water. It became the first well-publicized example of a country depleting its aquifers to near exhaustion. Now, its 30 million people are drinking mostly desalinated water from the ocean, which is too expensive to use for irrigation. But at one point, in the mid-1990s, Saudi Arabia was pumping so much groundwater that it transformed its deserts into the world’s sixth-largest exporter of wheat. But because its aquifers are depleted, the Saudi government announced that 2016 will be the last year the country produces wheat. It’s importing most of its crops from overseas – from places such as Arizona and California, which now have water problems of their own. This story was edited by Robert Salladay and copy edited by Sheela Kamath.